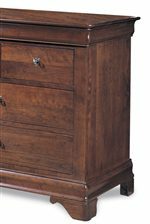 The Chateau Fontaine Traditional Solid Wood Bedroom Armoire by Durham at Jordan's Home Furnishings in the New Minas, Halifax, and Canning, Nova Scotia area. Product availability may vary. Contact us for the most current availability on this product.